Back in 1983, as one of the steps taken to bolster the long-run finances of the Social Security System, was to phase in a rise in the "normal" or "full" retirement age. 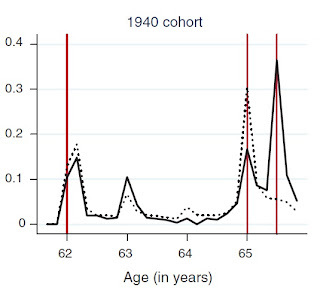 The normal retirement age for receiving full Social Security benefits had been 65, with "early retirement" with lower benefits possible at age 62. 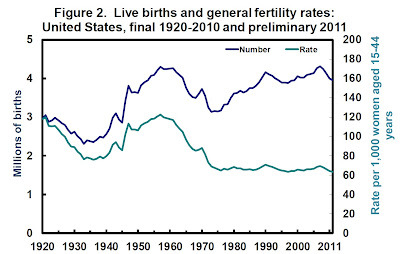 Under the new rules, the normal retirement age remained 65 for those born in 1937 or earlier--and thus turning 65 before 2002. It then phased up by 2 months per year, so that for those born six years later in 1943 or after, the normal retirement age is now 66. Written into law is a follow-up increase where a rise in the normal retirement age from 66 to 67 will be phased in, again at a rate of two months per year, for those born from 1955 to 1960. 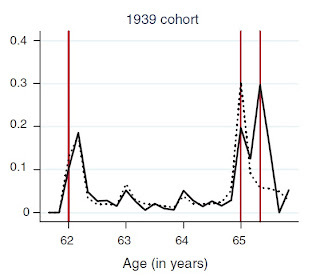 How has this change altered actual retirement patterns? What are the reasons, either for retirees or for the finances of Social Security, to encourage still-later retirement? Consider the following graphs from Behaghel and Blau. 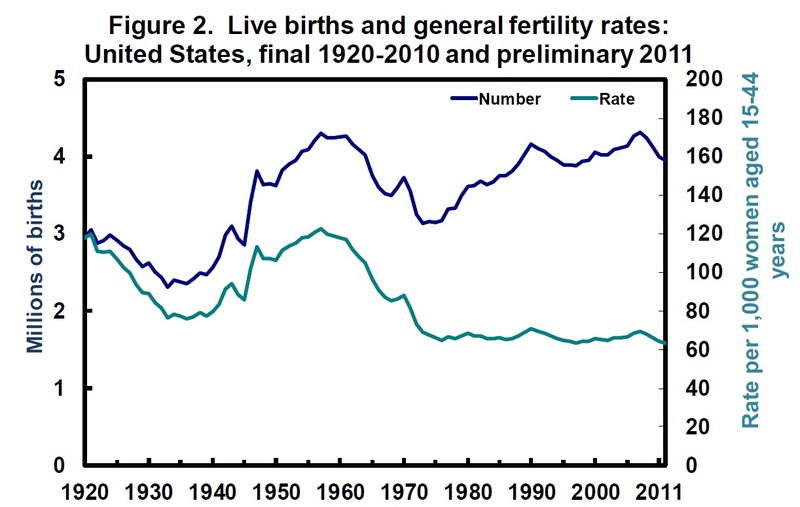 Each one is for those born in a different year, from 1937 up through 1942, as the normal retirement age phased up. These people are the ones hitting the normal retirement age of 65 in the early and mid-2000s. 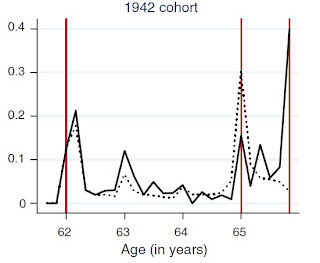 The solid line shows the probability of retirement at each age. 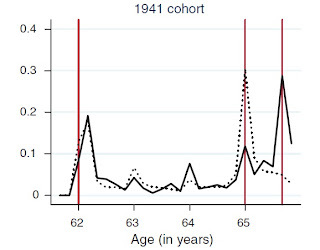 The early retirement age of 62 is marked with a vertical red line; the previous normal retirement age of 65 is marked with a vertical red line; and the actual retirement age for that year as it phases up two months per year is marked with a vertical red line. 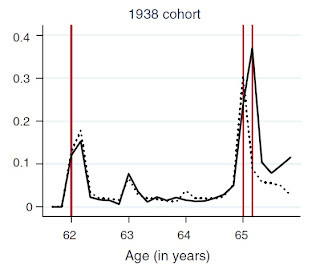 The dashed line, which is the same in all the figures, shows for comparison the retirement pattern for those born over the 1931-1936 period. 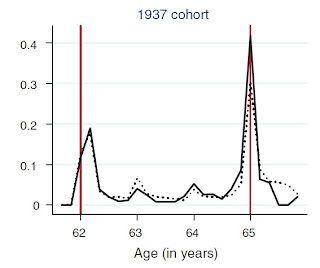 The main striking pattern is that the probability of retiring at a certain age almost exactly tracks the changes in the normal retirement age: that is, the solid line spikes at the red vertical line showing the normal retirement age. 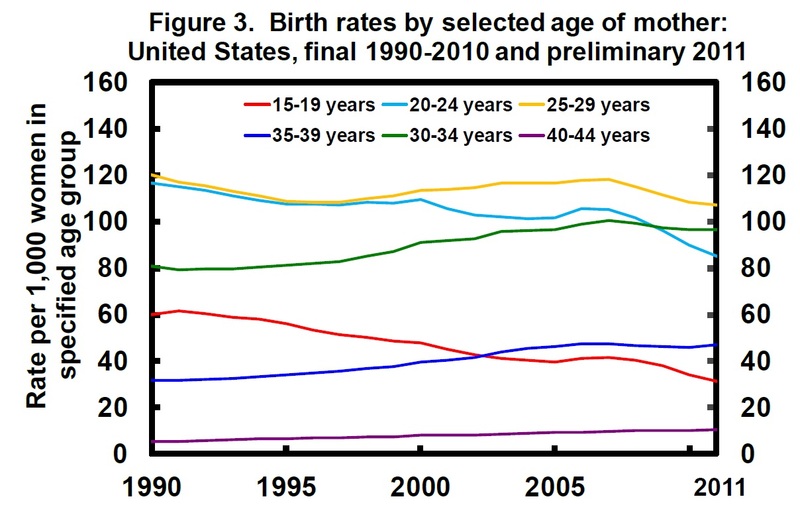 There is also a spike at the early retirement age of 62. Here are the patterns. The evidence here seems clear: People are making their retirement choices in synch with the government-set normal retirement age. 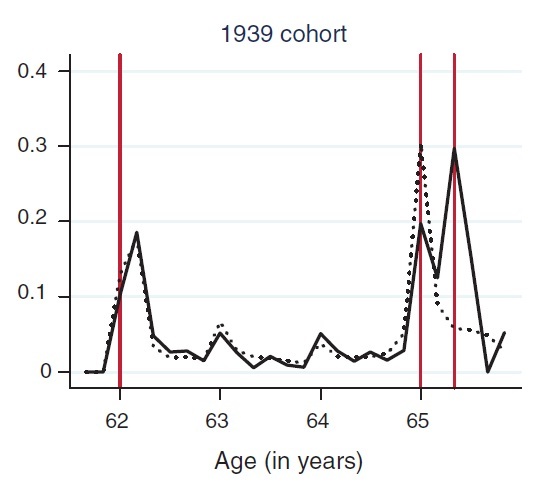 This pattern isn't new, as the authors point out, a spike in retirement age at 65 became visible in the data back in the early 1940s, about five years after Social Security became law. 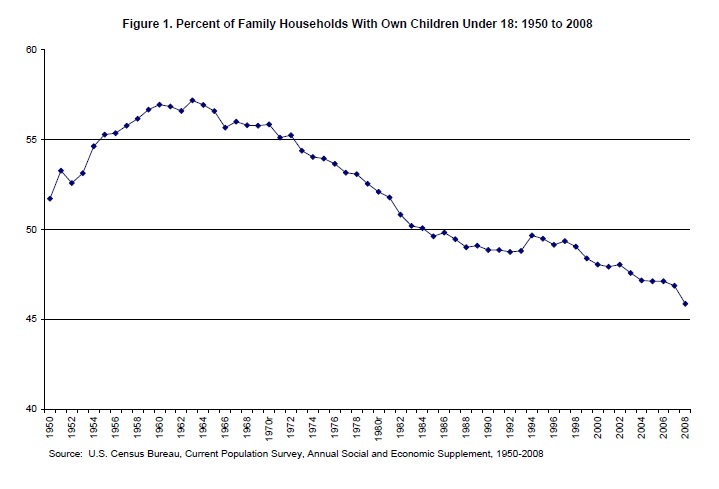 Still, the obvious question (for an economist) is why people would make this choice. If you retire later than the normal retirement age, your monthly benefits are scaled up, so from the viewpoint of overall expected lifetime payments, you don't gain from retiring earlier. 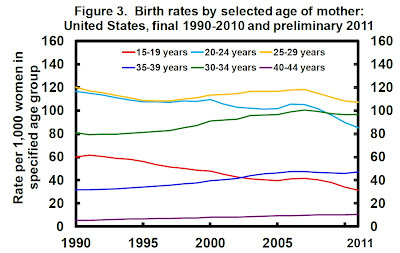 A number of possible explanations have been proposed: 1) people don't have other sources of income and need to take the retirement benefits as soon as possible for current income; 2) people are myopic, or don't recognize that their monthly benefits would be higher if they delayed retirement; 3) many people are waiting until age 65 to retire so that they can move from their employer health insurance to Medicare; 4) some company retirement plans encourage retiring at age 65. However, none of these explanations give an obvious reason for why the retirement age would exactly track the changes in Social Security normal retirement age, so it seems as if a final "behavioral" explanation is that the "normal" retirement age announced by the government, whatever it is, is then treated by many people as a recommendation that should be taken. Choosing a retirement date in this way is probably suboptimal both for individuals and for the finances of the Social Security system. Shlomo Benartzi, Alessandro Previtero, and Richard H. Thaler have an article on "Annuitization Puzzles," which makes the point that when you delay receiving Social Security, you are in effect buying an annuity: that is, you are taking less in the present--which is similar to "paying" for the annuity-- in exchange for a larger long-term payment in the future. They write: "[T]he easiest way to increase the amount of annuity income that families have is to delay the age at which people start claiming Social Security benefits. Participants are first eligible to start claiming benefits at age 62, but by waiting to begin, the monthly payments increase in an actuarially fair manner until age 70. " They further argue that a good starting point to encouraging such behavior would be to re-frame the way in which the Social Security Administration, and all the rest of us, talk about Social Security benefits. Imagine that, with no change at all in the current law, we all started talking about a "standard retirement age" of 70. We pointed out that you can retire earlier, but if you do, monthly benefits will be lower. 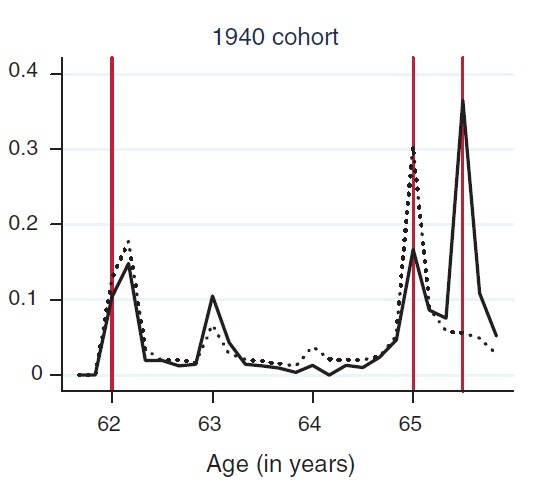 If the choice of when to retire was framed in this way, my strong suspicion is that many more people would react differently than when we announce that the "normal retirement age" is 66, and if you wait then your monthly benefits will be higher. Again, people seem to react to what the government designates as the target for retirement age. However, this labeling change might encourage people to work longer, but it would not affect the solvency of the Social Security system, because those who wait longer to retire are, in effect, paying for their own higher monthly benefits by delaying the receipt of those benefits. However, the Social Security actuaries offer a number of illustrative calculations on their website about possible steps to bolster the financing of the system. 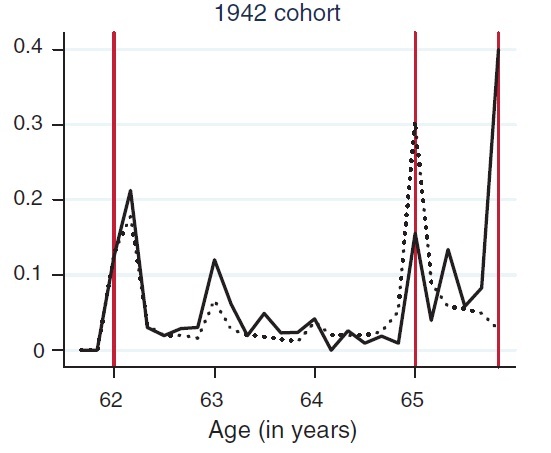 One proposal about phasing back the normal age of retirement looks like this: "After the normal retirement age (NRA) reaches 67 for those age 62 in 2022, increase the NRA 2 months per year until it reaches 69 for individuals attaining age 62 in 2034. Thereafter, increase the NRA 1 month every 2 years." Thus, this proposal would represent no change in the rules for Social Security benefits for anyone born before 1960--and thus in their early 50s at present. Under this proposal, those born after 1960 would face the gradual phase-in--but of course, they would also benefit from having a program that is much closer to fully funded. would face the same phase-in as currently exists. The actuaries estimate that this step by itself would address about 44% of the gap over the next 75 years between what Social Security has promised and the funding that is expected during that time. 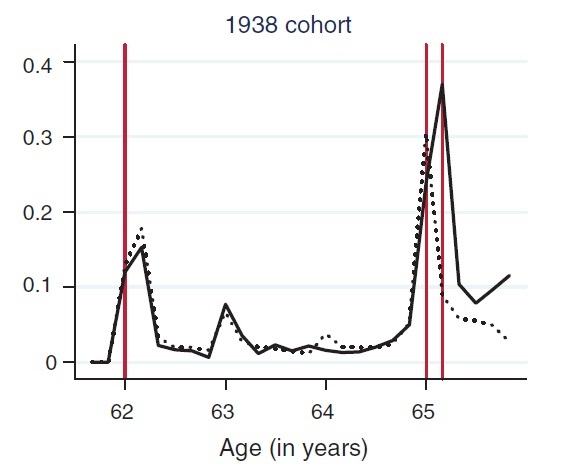 Given the predicted shortfalls of the Social Security system in the future, and the gains in life expectancy both in the last few decades and expected in the next few decades, and the parlous condition of large budget deficits reaching into the future, I would be open to proposals to phase in a more rapid and more sustained rise in the normal retirement age for Social Security benefits. 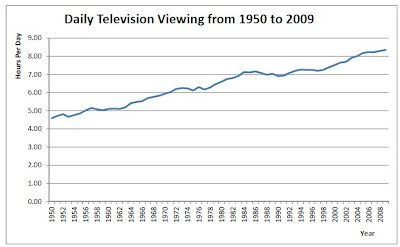 I recently ran across this historical data from the Neilson company for the time American households spend watching television, per day. 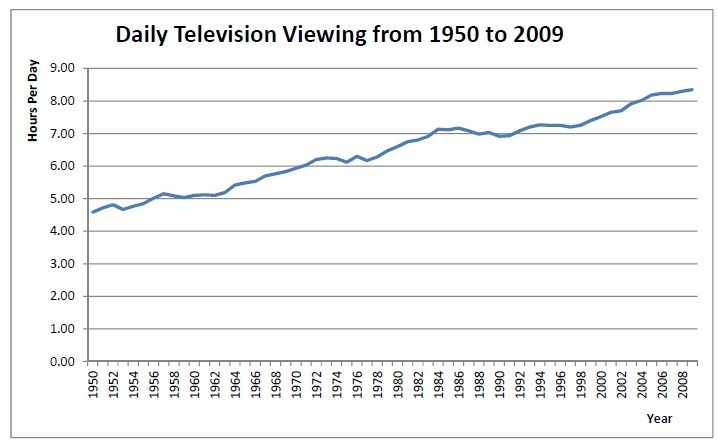 I rarely watch 8 hours of television per week, much less per day. I had a conversation the other day in which someone was incredulous that I have never seen an episode of Seinfeld, or Friends, or actually any sitcom in the last decade or so. I told them that I used to watch M*A*S*H now and then, and they looked at me with pity. Economists sometimes quote the old proverb: "De gustibus non est disputandum." There's no arguing over taste. We tend to accept consumer tastes and preferences as given, and proceed from there. I suppose that those of us who blog, and then hope for readers, can't really complain about those who spend time looking at a screen. I certainly have my own personal time-wasters, like reading an inordinate number of mysteries. I assume that for many people the television is on in the background of other activities. But at some deep level, I just don't understand averaging 8 hours of television per day. I always remember the long-ago jibe from the old radio comedian Fred Allen: "Television is a medium because anything well done is rare." 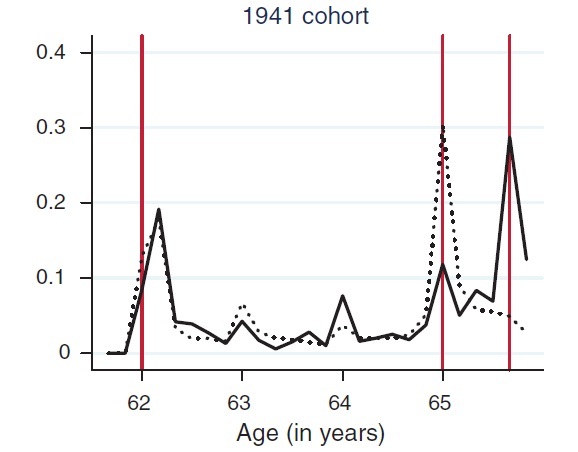 Note: Thanks to Danlu Hu for downloading the data and creating this figure. rather than upfront, payments. Paths to market are more winding and stonier. Government cuts are closing laboratories and culling blue-sky research. Never has there been a more pressing need to look beyond the existing pools of funding and talent to galvanize biomedical innovation." Thus, the papers look at a variety of interactions: interactions between universities and the biomed industry; different business models for biomed firms; how venture capital firms often seem to enter biomed start-ups "too early," well before a commercial payoff can be expected; funding research through nonprofit foundations that promote free dissemination of any findings; and others. But my eye was particularly caught by a proposal by caught by three economists, Jose-Maria Fernandez, Roger M. Stein and Andrew W. Lo, who offer a proposal for "Commercializing biomedical research through securitization techniques." These authors point out a paradoxical situation in biomedical research. On one side, the research journals and even the news media are full of breakthrough developments, "including gene therapies for previously incurable rare diseases, molecularly targeted oncology drugs, new modes of medical imaging and radiosurgery, biomarkers for drug response or for such diseases as prostate cancer and heart disease, and the use of human genome sequencing to find treatments for diseases that have confounded conventional medicine, not to mention advances in bioinformatics and computing power that have enabled many of these applications." On the other side, the existing business structures for translating these developments into new products doesn't seem to be working well. "Consensus is growing that the bench-to-bedside process of translating biomedical research into effective therapeutics is broken. ... 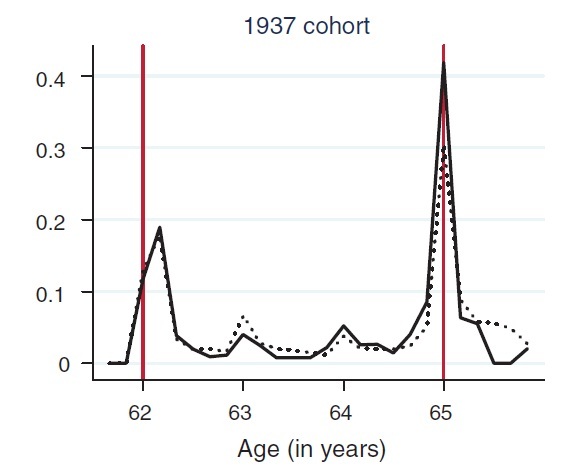 The productivity of big pharmaceutical companies—as measured by the number of new molecular entity and biologic license applications per dollar of R&D investment—has declined in recent years ... Life sciences venture-capital investments have not fared much better, with an average internal rate of return of −1% over the 10-year period from 2001 through 2010 ..."
"The traditional quarterly earnings cycle, real-time pricing and dispersed ownership of public equities imply constant scrutiny of corporate performance from many different types of shareholders, all pushing senior management toward projects and strategies with clearer and more immediate payoffs, and away from more speculative but potentially transformative science and translational research. ... Industry professionals cite the existence of a ‘valley of death’—a funding gap between basic biomedical research and clinical development. For example, in 2010, only $6–7 billion was spent on translational efforts, whereas $48 billion was spent on basic research and $127 billion was spent on clinical development that same year." What's their alternative? " We propose an alternative for funding biomedical innovation that addresses these issues through the use of ‘financial engineering’... Our approach involves two components: (i) creating large diversified portfolios—‘megafunds’ on the order of $5–30 billion—of biomedical projects at all stages of development; and (ii) structuring the financing for these portfolios as combinations of equity and securitized debt so as to access much larger sources of investment capital. These two components are inextricably intertwined: diversification within a single entity reduces risk to such an extent that the entity can raise assets by issuing both debt and equity, and the much larger capacity of debt markets makes this diversification possible for multi-billion-dollar portfolios of many expensive and highly risky projects. ... In a simulation using historical data for new molecular entities in oncology from 1990 to 2011, we find that megafunds of $5–15 billion may yield average investment returns of 8.9–11.4% for equity holders and 5–8% for ‘research-backed obligation’ holders, which are lower than typical venture-capital hurdle rates but attractive to pension funds, insurance companies and other large institutional investors. Frankly, I have no clear idea about whether the Fernandez, Stein, and Lo approach raising money for biomed companies is viable. One never knows in advance whether an innovation will function well and fulfill real-world needs, whether that innovation is financial or real. But if the markets can put together this sort of deal, it might offer an enormous boost to the process of translating biomedical innovation into actual health care products. In the aftermath of the Great Recession, the words "financial innovation" are often spoken with a heavy dose of sarcasm, as if all we need for a 21st-century economy is good old passbook savings accounts. But financial innovation like this Fernandez, Stein and Lo proposal is an example of how financial innovation might save lives by addressing an important real-world problem. This financial innovation seems well worth someone trying it out--with the proviso that if it doesn't work, no one gets bailed out! As President Obama and Mitt Romney jostled back and forth about the bailout of General Motors and Chrysler during the debate last night, I was naturally reminded of the 1953 confirmation hearings for Charles E. Wilson for Secretary of Defense. Wilson had been president of GM since 1941, overseeing both the company's transformation to wartime production and then its return to peacetime. Much of the confirmation hearing revolved around how he would sell off or insulate his financial holdings from his government job--and more broadly, the difficulties of separating his role at GM from the role of Secretary of Defense. "Senator Hendrickson. Mr. Wilson, you have told the committee, I think more than once this morning, that you see no area of conflict between your interest in the General Motors Corp. or the other companies, as a stockholder, and the position you are about to assume. Senator Hendrickson. Well now, I am interested to know whether if a situation did arise where you had to make a decision which was extremely adverse to the interests of your stock and General Motors Corp. or any of these other companies, or extremely adverse to the company, in the interests of the United States Government, could you make that decision? Mr. Wilson. Yes, sir; I could. I cannot conceive of one because for years I thought what was good for our country was good for General Motors, and vice versa. The difference did not exist. Our company is too big. It goes with the welfare of the country. Our contribution to the Nation is quite considerable. I happen to know that toward the end of the war—I was coming back from Washington to New York on the train, and I happened to see the total of our country's lend-lease to Russia, and I was familiar with what we had done in the production of military goods in the war and I thought to myself, "My goodness, if the Russians had a General Motors in addition to what they have, they would not have needed any lend-lease," so I have no trouble—I will have no trouble over it, and if I did start to get into trouble I would put it up to the President to make the decision on that one. I cannot conceive of what it would be. Senator Hendrickson. Well, frankly, I cannot either at the moment, but we never know what is in store for us. Senator Hendrickson. I certainly hope not. Mr. Wilson. You see, if that one came up for some reason or other then I would not like that. I do not think I would be on the job; I think I would quit because I would be so out of sympathy with trying to nationalize the industries of our country. I think it would be a terrible thing. That is about the only one I can think of. Of course, I do not think that is even a remote possibility. I think the whole trend of our country is the other way." I've quoted here from the transcript of the actual hearings as printed in "Nominations: Hearings before the Committee on Armed Services, United States Senate, Eighty-third Congress, first session, on nominee designates Charles E. Wilson, to be Secretary of Defense; Roger M. Kyes, to be Deputy Secretary of Defense; Robert T. Stevens, to be Secretary of the Army; Robert B. Anderson, to be Secretary of the Navy; Harold E. Talbott, to be Secretary of the Air Force ..." January 15, 1953. But the hearing had been closed to the public, and the transcript didn't come out for a few days. When reporters asked what had been said, they were told that Wilson had simply replied: "What's good for General Motors is good for the country." Democrats picked up the phrase on the campaign trail and used it against Republicans for being overly pro-business. The highly popular Li'l Abner comic strip had a character named General Bullmoose who often said: "What's good for General Bullmoose is good for the U.S.A.!" The story goes that for a few years, when the quotation came up, Wilson would try to offer some context, but after awhile he stopped bothering. When he stepped down as Secretary of Defense in 1957, he said: " "I have never been too embarrassed over the thing, stated either way." Of course, it's interesting that the Democratic party that bashed Charlie Wilson back in 1953 now finds itself in the position of arguing the modern version of "what's good for General Motors is good for the country." For those who want details about the actual bailout, my May 7 post on "The GM and Chrysler Bailouts" might be a useful starting point. Here, I would just make the point that while GM remains an enormous company today, it was relatively much larger in the 1950s. In the Fortune 500 for 1955, General Motors was far and away the biggest U.S. company ranked by sales. GM had $9.8 billion in sales in 1955, with Exxon running second at $5.6 billion, U.S. Steel third at $3.2 billion, followed by General Electric at $3 billion. The GDP of the U.S. economy in in 1955 was $415 billion, so for perspective, GM sales were 2.3% of the U.S. economy. In 2012, GM's sales are $150 billion, but in the Fortune 500 for 2012, it now runs a distant fifth in sales among U.S. firms. The two biggest firms by sales were Exxon Mobil at $450 billion in sales, just a few billion ahead of WalMart. The GDP of the U.S. economy is about $15 trillion in 2012, so GM sales are now more like 1% of GDP, rather than 2%. And many of those who argue that it was in the national interest to give GM more favorable government-arranged bankruptcy conditions, rather than the usual bankruptcy court, would likely be quite unwilling to give bailouts to Exxon Mobil or to WalMart--despite how much larger they are. As the world population continues to climb toward a projected population of 9 billion or so by mid-century, can agricultural productivity keep up? Keith Fuglie and Sun Ling Wang offer some thoughts in "New Evidence Points to Robust But Uneven Productivity Growth in Global Agriculture," which appears in the September issue of Amber Waves, published by the Economic Research Service at the U.S. Department of Agriculture. 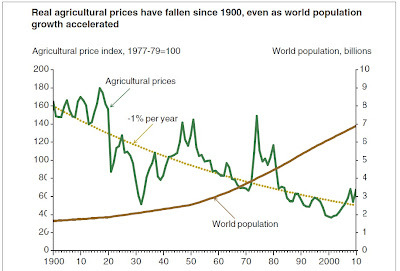 Food prices have been rising for the last decade or so. Fuglie and Wang offer a figure that offers some perspective. The population data is from the U.N, showing the rise in world population from about 1.7 billion in 1900 to almost 7 billion in 2010. The food price data is a a weighted average of 18 crop and livestock prices, where the prices are weighted by the share of agricultural trade for each product. 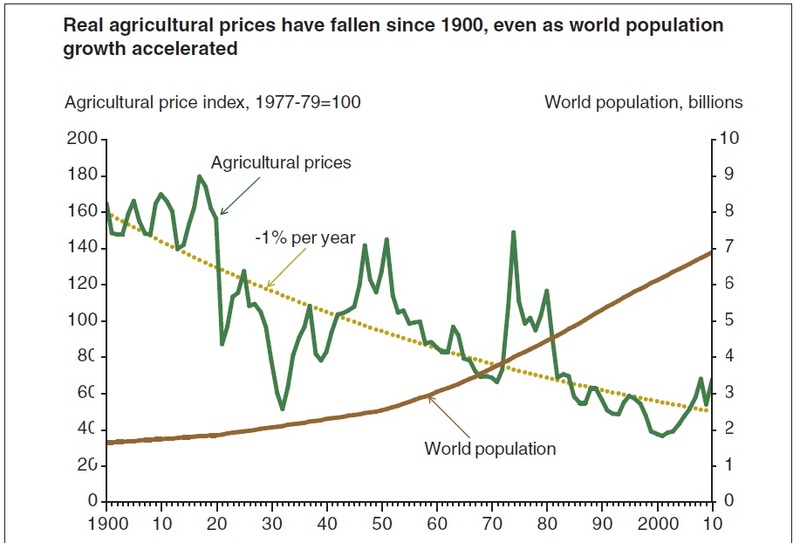 Despite the sharp rise in demand for agricultural products from population growth and higher incomes, the rise in productivity of the farming sector has been sufficient so that the price of farm products fell by 1% per year from 1900 to 2010 (as shown by the dashed line). What are some main factors likely to affect productivity growth in world agriculture in the years ahead? Here are some of the reactions I took away from the paper. Many places around the world are far behind the frontier of agricultural productivity, and thus continue to have considerable room for catch-up growth. "Southeast Asia, China, and Latin America are now approaching the land and labor productivity levels achieved by today's industrialized nations in the 1960s." 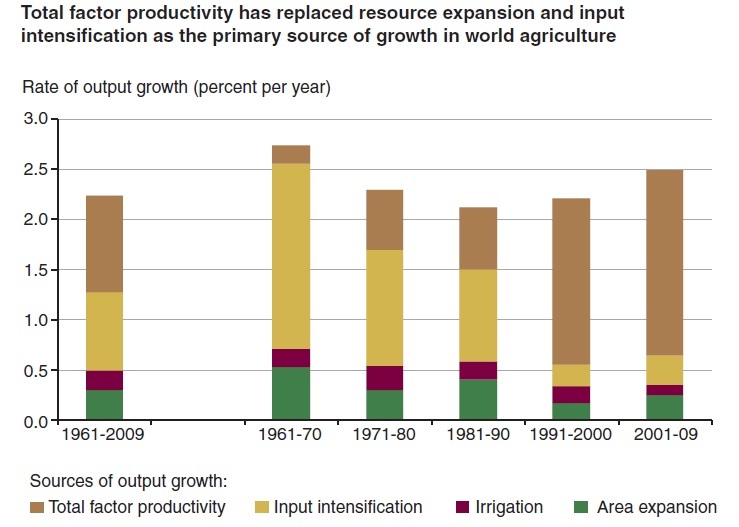 The rate of output growth in agriculture hasn't changed much, but the sources of that output growth have been changing from a higher use of inputs (machinery, irrigation, fertilizer) and toward a higher rate of productivity growth. "Global agricultural output growth has remained remarkably consistent over the past five decades--2.7 percent per year in the 1960s and between 2.1 and 2.5 percent average annual growth in each decade that followed. ... Between 1961 and 2009, about 60 percent of the tripling in global agricultural output was due to increases in input use, implying that improvements in TFP accounted for the other 40 percent. TFP's share of output growth, however, grew over time, and by the most recent decade (2001-09), TFP accounted for three-fourths of the growth in global agricultural production." Sub-Saharan Africa has perhaps the greatest need for a productivity surge, because of low incomes and expected rates of future population growth, but is hindered by a lack of institutional capacity to sustain the mix of public- and private-sector agricultural R&D that benefits local farmers. "Sub-Saharan Africa faces perhaps the biggest challenge in achieving sustained, long-term productivity growth in agriculture. ... Raising agricultural productivity growth in Sub-Saharan Africa will likely require significantly higher public and private investments, especially in agricultural research and extension, as well as policy reforms to strengthen incentives for farmers. Perhaps the single, most important factor separating countries that have successfully sustained long-term productivity growth in agriculture from those that have not is their capacity for agricultural R&D. Countries with national research systems capable of producing a steady stream of new technologies suitable for local farming systems generally achieve higher growth rates in agricultural TFP. ... Improvements in what can broadly be characterized as the "enabling environment" have encouraged the adoption of new technologies and practices by some countries; these include policies that improve economic incentives for producers, strengthen rural education and agricultural extension services, and improve rural infrastructure and access to markets." There's no denying that feeding the global population as it rises toward nine billion will pose some real challenges, but it is clearly within the realm of possibility. For more details on how it might be achieved, here's my post from October 2011 on the subject of "How the World Can Feed 9 Billion People." 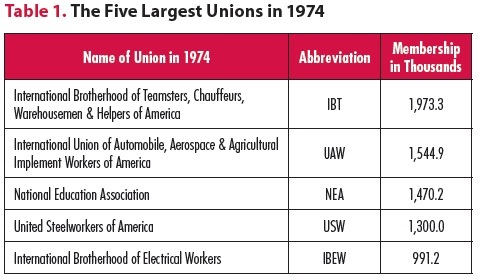 John Pencavel offers an angle on the evolution of American unions that I haven't seen recently by looking at the number of unions and their size. Short story: the number of American unions has declined, but the biggest unions have many more members than their precedessors. Pencavel has a nice summary of this work in "Public-Sector Unions and the Changing Structure of U.S. Unionism," written as a "Policy Brief" for the Stanford Institute for Economic Policy Research. 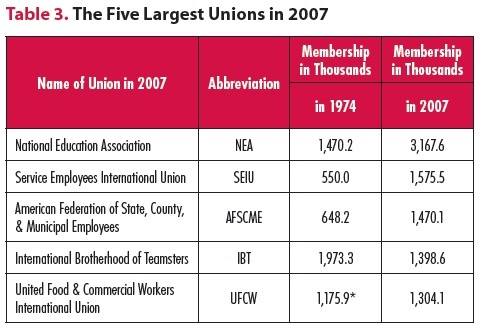 As a starting point, the first table shows the top five U.S. unions by total number of members in 1974, and then the top five unions by total number of members in 2007. A couple of patterns jump out. First, back in 1974, most of the biggest unions--except for the National Education Association--were private-sector unions. However, by 2007, most of the biggest unions were public-sector union. 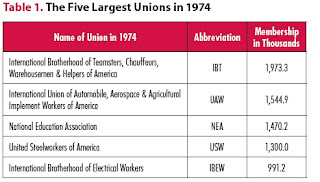 BSecond, both the biggest union in 2007 (the NEA) and the fifth-biggest union in 2007 (the UFCW) were substantially larger than the first- and fifth-biggest unions in 1974. Pencavel compiles evidence that from 1974 to 2007, the total number of unions declined by 101, much of that due to unions consolidating with others. Unions with more than 1 million members actually had 2.7 million more total members in 2007 than back in 1974; conversely, unions with fewer than 1 million total members had 6.8 million fewer total members in 2007 than in 1974. 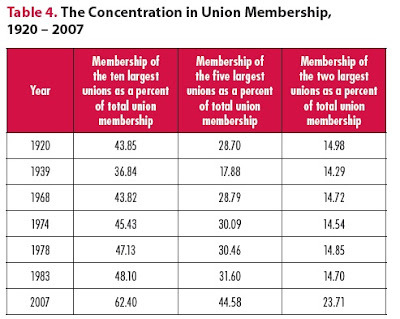 In other words, union members are much more likely to belong to a very large unions now than a few decades ago. Pencavel also compiles a longer-run table, going back to 1920, to show the share of unions members belonging to the biggest unions. Notice that most of the shift toward much larger unions has occurred since the early 1980s, and most of it traces to a change in the membership share of the largest unions. I suppose that one response to all this is "so what"? Well, if the largest companies in the U.S. economy in any given industry gain a dramatically larger share of the U.S. economy, it gives rise to comment. When the largest unions gain a dramatically larger share of the union sector, it's worth some introspection, too. Pencavel draws his conclusions cautiously. "[A] union movement concentrated in a smaller number of large unions implies a union movement in which much of its wealth is allocated by a smaller number of decision-makers. ... A serious concern is that a more concentrated union movement dominated by public sector unions may politicize unionism: That is, the focus of union activity will be less on attending to grievances and to the conditions of members at their place of work and more on issues that are the province of politics. ... Unions have always been involved in politics so this would be a change of degree, not of kind, but it is an important change because, ultimately, more politicized unionism will not help the typical union worker." Albert Venn Dicey was a British legal theorist who died in 1922. Pencavel refers to one of his works from 1912, when Dicey was mulling over the issue of freedom of association, both in thinking about association through labor unions and association through product cartels. Pencavel notes that Dicey perceived a "classic dilemma" here, and Pencavel writes: "The principle that working people should have the freedom to form associations that represent and guard their interests is an intrinsic feature of a liberal society. But, if these associations exploit this principle to procure entitlements that expense of others, a new base of authority and influence is created that, at best, enjoys a greater share of the national wealth and, at worst, challenges the jurisdiction of the state. A balance is needed between promoting the principle of free association and avoiding the creation of a mischievous organization." The central question about large public sector unions, of course, is whether in their ability to act as an powerful interested group that influences the results of state and local elections and then to have their conditions of employment determined in negotiations with officials of those same state and local governments, they have exploited the freedom of association in a way that creates what Pencavel calls a "mischievous organization." Pencavel ends on a questioning note: "This is not a prediction; it is a concern." 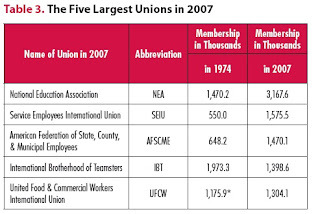 For more about U.S. union members, see my post "Some Facts about American Unions" from last March. The official announcement reads this way: "The Sveriges Riksbank Prize in Economic Sciences in Memory of Alfred Nobel 2012 was awarded jointly to Alvin E. Roth and Lloyd S. Shapley `for the theory of stable allocations and the practice of market design.'" Thus, the prize seeks to emphasize the interplay between mathematical economic theory and concrete applications. Each year when the Nobel prize is awarded, the Prize Committee puts up some useful background material to explain their choice: their "Popular Information" paper is here and the "Scientific Background" paper is here. I'll draw on both in what follows. In this duality between theory and application, Lloyd Shapley is cast as the theorist. Indeed, in an interview with the AP on Monday, he said: "I consider myself a mathematician and the award is for economics. I never, never in my life took a course in economics." But of course, economists view their field as a big enough tent to include at least some mathematicians--and in particular those that study game theory, like the 1994 Nobel prize to John Nash and others. In Shapley and co-author David Gale published a famous paper in 1962 in the American Mathematical Monthly called "College Admissions and the Stability of Marriage (69:1, pp. 9-15). It can be read for free (with registration) at JSTOR, or it is available on the web various places like here. They begin by offering college admission as an example of the kind of problem they are considering. There are a number of colleges and a number of applicants. Colleges have preferences over who they wish to admit, and applicants have preferences over where they would like to attend. How can they be matched in a way that will, in some sense we need to define, "satisfy" both sides? Before going further, notice that this problem of multiple parties on each side, with a problem of matching them so as to "satisfy" all parties, is a characteristic of marriage markets--although in that case the two groups are looking for only one partner apiece--and also of employers and potential employees in the job market. As a starting point, it is clearly impossible to "satisfy" all parties in the sense that everyone will get their first choice. The college can't assure that all its preferred applicants will want to attend; not all applicants are likely to get their first choice. Thus, Gale and Shapley focused instead on finding a solution that would be "stable," which means in the context of the college admissions choice that once everyone is matched up, there is no combination of a student who would rather be at a college other than the one they are attending AND that college would also prefer to have that student above one of the students it had already attracted. In other words, no student or college will seek to make an end-run around a stable mechanism. nally accept the proposals they hold. rst offer to its top-ranked applicant, i.e., the medical student it would most like to have as an intern. If the offer is rejected, it then makes an offer to the applicant it ranks as number two, etc. Thus, during the operation of the algorithm, the department's expectations are lowered as it makes offers to students further and further down its preference ordering. (Of course, no offers are made to unacceptable applicants.) Conversely, since students always hold on to the most desirable offer they have received, and as offers cannot be withdrawn, each students satisfaction is monotonically increasing during the operation of the algorithm. When the departmentsdecreased expectations have become consistent with the studentsincreased aspirations, the algorithm stops." "The Gale-Shapley algorithm can be set up in two alternative ways: either men propose to women, or women propose to men. In the latter case, the process begins with each woman proposing to the man she likes the best. Each man then looks at the different proposals he has received (if any), retains what he regards as the most attractive proposal (but defers from accepting it) and rejects the others. The women who were rejected in the first round then propose to their second-best choices, while the men again keep their best offer and reject the rest. This continues until no women want to make any further proposals. As each of the men then accepts the proposal he holds, the process comes to an end." Gale and Shapley prove that this procedure leads to a "stable" outcome. Again, this doesn't mean that everyone gets their first choice! It means that when the outcome is reached, there is no combination of medical school and applicant, or of man and woman in the marriage example, who would both prefer a different match from the one with which they ended up. But Gale and Shapley went further. It turns out that there are often many stable combinations, and in comparing these stable outcomes, the question of who does the choosing matters. If women propose to men, women will view the outcome as the best of all the stable matching possibilities, while men will view it as the worst; if men propose to women, men as a group will view it as the best of all stable matching possibilities, while women will view it as the worst. As the Nobel committee writes, "stable institutions can be designed to systematically favor one side of the market." There are many other potential tweaks and twists here. What if monetary payments are part of the match? What if traders are trading indivisible objects? These sorts of issues and many others kept a generation of game theorists busy. But for present purposes, the next key insight is that although I've explained the deferred-acceptance procedure as a step-by-step process, where parties make one offer at a time, an equivalent process can be run by a clearinghouse, if the parties submit sufficient information. And this is where Alvin Roth enters the picture, bringing in detailed practical implications for analysis. He pointed out in a 1984 paper that the National Resident Matching Program for matching residencies and medical school students was actually a close cousin to the Gale-Shapley procedure. Roth's theoretical analysis pointed out that the form of the match they were using allowed the medical schools, rather than the students, to be the "proposers," and thus created outcomes that the medical schools viewed as the best of the stable options and the students viewed as the worst of the stable options. He redesigned the "match" both to let students be the proposers, and also to address the issue that in a number of cases a married or committed couple wanted to end up at the same school or in the same geographic location. Roth then found other applications for what he has called the "market design" approach. (It is ironic but true that the market design approach can include prices if desired, but doesn't actually need prices to function.) The key problems in these matching scenarios often involve timing. There is often pressure on various parties--whether marriage or college admissions--to commit early, which can lead to situations where the outcome will "unravel" as people seek a way out of their too-early commitments. On the other side, if the process slogs along too late, then "congestion" can result when an offer is turned down and it becomes too late to make other offers. Roth found applications of the Shapley matching approach in a wide variety of academic matching settings, both in the U.S. and in other countries. He also applied a similar process to students choosing between public schools in New York City and Boston. More recently, he has sought to apply these insights to the problem of matching kidney donors with those in need of a kidney transplant. (In fairness, it should be pointed out that Roth has written a number of strong theoretical papers as well, but the Nobel committee emphasized his practical concerns, and I will follow their lead here.) As one might expect, these real-world cases raise various practical problems. Are there ways of gaming the system by not listing your first choice, which you are perhaps unlikely to get anyway, and pretending great enthusiasm for your fifth choice, which you are more likely to get? Such outcomes are sometimes possible in practical settings, but it proves much harder to game these mechanisms than one might think. Usually, you're better off just giving your true preferences and seeing how the mechanism plays itself out. The Nobel prize to Shapley and Roth is one of those prizes that I suspect I will have a hard time explaining to non-economists. The non-economists I know ask practical questions. They want to know how the work done for the prize will spur the economy, or create jobs, or reduce inequality, or help the poor, or save the government money. Somehow, better matching for medical school students won't seem, to some non-economists like it's "big enough" to deserve a Nobel. 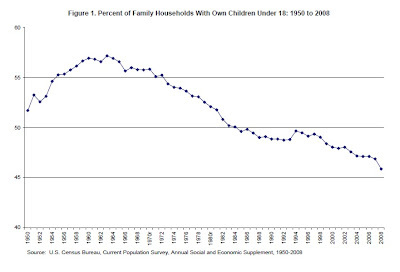 But economics isn't all about today's public policy questions. The prize rewards thinking deeply about how a matching process works. In a world of increasingly powerful information-processing technology, where we may all find ourselves "matched" in various ways based on questions we answer by software we don't understand, I suspect that Alvin Roth's current applications are just the starting point for ways to apply the insights developed from Lloyd Shapley's "deferred acceptance" mechanism.